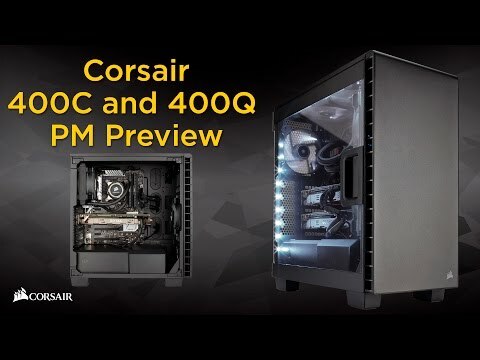 Corsair Carbide 400C Clear, Compact Mid Tower Computer Chassis, ATX/MicroATX/Mini-ITX, with Window, USB3.0, Black is rated 4.8 out of 5 by 5. Rated 4 out of 5 by CPPCoder from Did not meet my needs But that's because i did not research this product enough or RTFM too well. It's a small medium. No space for optical drives. I have an old Corsair 1KW PSU brick which only fitted in by taking out the 3.5" hard drive cage and the PSU shroud. I fitted 3 SSDs. There is just enough room for attaching the power and data cables to these drives as the side cover comes up against them. Good job I had a lot of cables in my kitbag to choose from. The water cooling fan unit I used fitted OK but still had to be careful of positioning as it butted up against the case's MB cables. It's about time MB and case manufacturers sorted out this mess of attaching HDD led, reset, power leads etc. between case and MB. It should be only one block connector at the most. All these pins to fiddle with! Quailty seemed good. The air filters are good but are still not that easily accessible. You have to rip of the front of the case to get to the front one. If ever case makers get this right let me know. Overall good. Make sure you read the manual first! Rated 5 out of 5 by Nomis from Sleek, Robust & Tidy. This case is beautiful and has great cable management. Ample space for big graphics cards (in this case a massive Palit GTX 1080 Jet Stream). Relatively quiet and cool, if airflow is set up correctly. Worth noting that this has no optical drive bays - though I haven't needed to use a cd in years so seems natural to move on from them now. Rated 5 out of 5 by senatemaiden from What a case Pros- The best case so far I used. My 240mm h100i water cooler could mount on top or the right hand side of the case, Great swivel window. Cable management is superb, Cons- Wish the front was glass window so could show of a bit of illumination or at least the smiliar design like the 760t, with double 120mm led fan at the front. The power supply enclosure is a bit fiddly. Overall, can't go wrong with the case, the best case for someone who loves mid tower, it's quite a good size for a small desk. Rated 5 out of 5 by Fearless1885 from Excellent case. Every time i decided on buying this case it would be out of stock. I had been toying with the idea of black or white and colour schemes to go in tow. Fully populated with fans, so far i have x2 ML140's on the roof of the case. x2 120's on the H110i CPU cooler with x1 120 at the rear of the case. On idle temps sit around 28 degrees and around 50 in game. Ref: Arma 3. It is a PERFECT fit for an ATX (Asus x99-A), sitting just 1/2mm off of the PSU/HDD compartments. I have my case on my desk and it beats the R4 by miles on style, size and weight especially if you take your rig to LAN or other events. I cannot find a fault in this case. Highly recommended alongside Scan's excellent service. Rated 5 out of 5 by Mark141988 from Great case, easy to build in and worth the money! I have been waiting for this case to come in stock since it was first announced and it was definitely worth the wait. The case looks amazing on my desk and doesn't seem to take up much room, I have however only used full sized cases in the past, but in comparison to them it's small and looks great! The case is easy to build in with plenty of cable routing options to make the final build look nice and clean. The large side window looks great and the hinged door is a nice feature for quick easy access. I stripped my old pc and re-built into this one all within 2 hours and that includes all the routing of cables correctly and dusting the components off. There are plenty of dust filters in place to help keep the insides of your PC nice and clean and I don't think I will miss not having an optical drive one bit. I Ordered on 23rd Feb and received at 8:20am 24th Feb. Great service from Scan and the case arrived intact and well packaged. A great case and I would definitely recommend it! Does the front open to reveal the CD bay? There is no CD bay in this case. This is a growing trend with CD's becoming less and less relevant. I struggled for a moment when choosing this case as I've always had an optical drive/bay before, but realised that I haven't actually needed to use any CD's in years - besides boot discs which can be replaced by booting from USB. The front of case does come off, but this is just to swap out or re-position fans and or dust filter etc. More and more cases are moving away from CD bays. If you can live with abandoning CD's it's worth it, the space saved from not having the bays in there makes it a lot easier to work with.